HYDROSTATIC TEST PUMPS Richard Dudgeon, Inc. hydrostatic test pumps rated from 1000 to 12000 PSIG. APPLICATIONS - Manually operated, light but sturdy pumps providing pressures up to 12,000 PSIG with water or oil. Low cost pressure source for testing piping, boilers, tanks, fire extinguishers, pressure tanks, and laboratory equipment. 7J - Weighing only 27 pounds on an aluminum channel base and in a shipping carton. Shipping dimensions are 24.75" x 4.5" x 5". 7J - The lever fulcrum may be mounted in either of two positions. 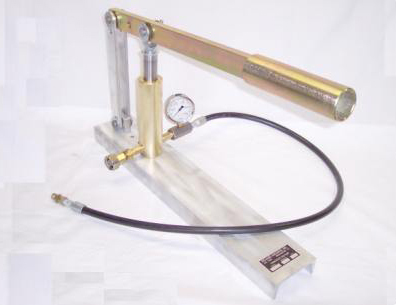 One delivers higher pressure per 100 pounds lever load (max. leverage). The other delivers greater displacement (output) per lever stroke (std. leverage). (See tables for data.) In addition, a handle extension is provided to increase the advantage for higher pump pressures. 7J - Intake (suction) connection is a female hose swivel with screened coupling washer for attachment of standard garden hose. Output (pressure) connection is ¼” NPT female pipe at the end of the gauge block, Four foot flexible hose with ¼” NPT ends are included. Pressure gauges are optional. Gauges: To ¼ % accuracy, 4" and 6" dial size. Master, certified, and other dial sizes available. Fittings: Special valves, hose, and seals. Adapter Kit: Flexible hose 3/16" ID with 1/4" NPT ends x 4 feet, bleed valve, and assorted NPT fittings. Seals: Buna N o-rings standard for many fluids; other materials upon request.